Retail giant Walmart has applied to patent a blockchain system that will enable secure deliveries by autonomous robots. The Patent is called “Systems, Devices, and Methods for In-Field Authenticating of Autonomous Robots” and specifies that delivery drones and household robots will be able to authenticate each other using built in security measures. 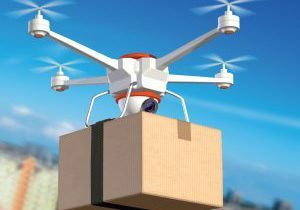 Walmart has plans for an advanced system of robot and drone deliveries all across supply chain. According to article, Walmart’s Latest Blockchain Patent Lets Robots Conduct Deliveries Across Supply Chain, “the machines are intended to operate based on wireless signals that enable blockchain-powered secure authentication of electronic devices’ identities.” This is only one of many patents that Walmart has applied for in the U.S. in the past year. Blockchain technology enhancement is vital if Walmart wants to keep up competitors such as Amazon. Visit MHI View for video updates on the latest news and technology on Robotics and Automation and Driverless Vehicles and Drones.